Always at the forefront of technological development in surface measurement systems, PDI introduces the completely modular Series 800 Surfometers. All Series 800 models utilize the same basic hardware, with difference determined by the software installed. Starting with the multiple parameter, the amplifier may be upgraded for future needs by simply adding parameter software modules. Simplicity is also inherent in the operation of the instrument, with selected parameter, cutoff and system settings. The display is full color, bright, and has a wide viewing angle, making it easy to read from any position. 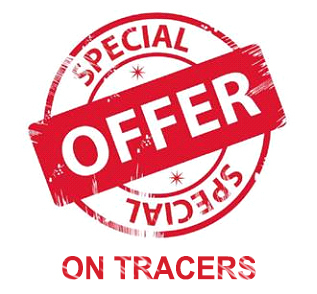 User can view the traces results as well as a two dimensional display of the trace. The amplifier allows the user to overlay two traces (two dimensional display) while in the View Trace mode. The Series 800 Amplifier is a sophisticated yet easy to use instrument with a modular surface texture program. All models feature a 7-inch diagonally measured full color display, a remote start switch port and lockout software. Operation is at once simple, sophisticated and secure. The instrument is configured by an easy-to-read set-up menus. The user selects the proper settings for the cutoff, stroke length, Gaussian or the optional Rk Filter, and parameter functions. Set the exact stroke length required or use the standard 5-cutoffs. Once configured, the system operates by pressing the Start Button or through use of an optional remote start switch. The Series 800 amplifier will support up to eight templates for different parts using different cutoff values as well as different stroke lengths. User assigned templates can be assigned part names up to 10 alpha and numeric characters. The skidless motor drive has an internal reference in the drive unit. Skidless instruments of the 800 Series are designed to evaluate small, difficult-to-reach areas that are not accessible by skid-type tracers. The motor drive is mounted on a granite base to minimize vibration and to provide a level, stable surface for locating the work piece. For more precise measurement setup, the stroke length can be set to the proper distance for the surface being measured. This is ideally suited for short stroke requirements such as grooves. This drive may also be programmed to acquire data in either direction. The rotary piloter is designed to measure inside and outside diameters of parts such as balls, ball studs, and extruded tubing. The part is rotated across a stationary tracer, through an arc perpendicular to the lay. The drive, with proper tooling, will trace parts with a range from 6.35 mm to 63.5 mm (0.250 in to 2.500 in) inner or outer diameter. The amplifier will automatically adjust the speed of the rotary piloter, based upon the diameter of the measurement area, to attain a constant speed of 0.1 in/sec 2.54 mm/sec). The piloter is able to take readings in clockwise or counterclockwise directions. It is easy to use, and can be changed from one part to another in seconds. 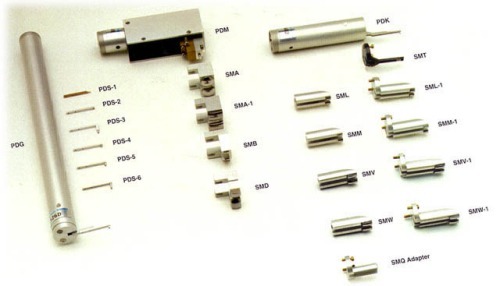 The part can be mounted with exchangeable clamping devices. PDK The versatile PDK tracer, with the single SMT skidmount, can measure a 1/8 in. I.D. and O.D. to flat surfaces. The PDK has a series of standard, interchangeable double skidmounts available for most surface texture requirements. 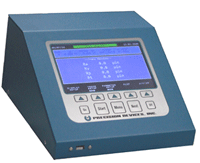 PDM Rugged and durable, the PDM style tracer provides accurate reading throughout the surface texture measurement range. 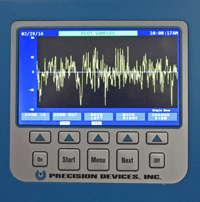 From super-fine to high micro finished, the PDM tracer offers the reliability for critical surface evaluation. Standard skidmounts permit measurements on outside diameters as small as 1/8 in to inside diameters from 1 13/16 in to flat surfaces. The PDG tracer does not use skids, but has various standard stylus assemblies that mount onto the tracer beam. Contact your Precision Devices, Inc. representative for additional information.